Selecting the right builder to look after your next commercial project is one of the most important steps toward a successful outcome. Choosing the wrong builder can potentially result in delays, significant financial loss and a lot of frustration. In order to choose a builder that is not only experienced but reliable, it is important to know what to look for. Here are some key things to consider to ensure you’re selecting a builder that you can trust with your next commercial project. Does the builder specialise in commercial projects? It is important to select a builder that specialises in commercial building, as they will understand exactly what you need and will have the necessary skills to complete your job properly. Commercial projects can often be fairly complex and unique in nature. The right builder will recognise this and have the appropriate experience and infrastructure in place to ensure they deliver a great result. They will also have the skills to both design and understand the challenges of building in a commercial environment. It is important to note that not all builders have the necessary skills, experience and equipment to complete commercial projects. By selecting a specialist builder you are giving yourself the best chance at minimising any risk associated with the project. It is recommended that you choose a builder that not only has proven experience with commercial construction, but experience in the different sectors within commercial construction. By working with an established company such as Nulex Construction, you can be assured that all elements of your project are completed to national construction codes, to the highest possible standard and on schedule and that we have a vast amount of specific experience. An experienced company will also have established relationships with reputable suppliers who provide competitive pricing on quality materials and have access to reliable contractors. A company with a solid reputation for quality work can also provide peace of mind that your project will be completed to schedule in the most effective way possible. Experience really cannot be underestimated in the commercial world. A project that is managed effectively will save you time and money and have you operating in your new premises as soon as possible. Do they have a portfolio of past work? Most professional commercial builders will have a portfolio of their past projects. This can often be found on their website or can be requested from the builder directly. By looking at a builders past projects you will have the opportunity to look at their quality of work, the types of commercial projects that they have previously completed and the complexity of them. This should generally give you a good idea of whether a potential builder is suitable for your commercial project. Do they have a list of reliable references? When selecting a builder you have the right to ask for references for previous jobs they have completed. This can help you to get an idea of what to expect when working with them as well as if they are a reliable choice. Does the builder offer value for money? Finally, while price should not be your sole reason for selecting a building, assessing the value of their services can be a good way to compare builders and to make the best choice to suit your budget. A great commercial builder will offer their expertise on how the project could possibly be improved, can be more financially viable and how it can be completed to your schedule. Generally, it really is a case of ‘you get what you pay for’ and we recommend paying more for higher quality work than paying less for an inferior result. We offer value by providing competitive quotations, offering design solutions and scheduling and completing all projects in an efficient and timely manner, to minimise the impact on your business operations. When selecting a commercial builder it is important to select one that is not only specialises in commercial projects but also has the experience, skills, reputation and a fruitful portfolio of past projects to ensure your commercial project is completed to the highest standard, on time and within budget. Mark and Alex bring over 50 years of combined experience and are hands on in all projects and have a skilled team working with them to ensure the right result, every time. 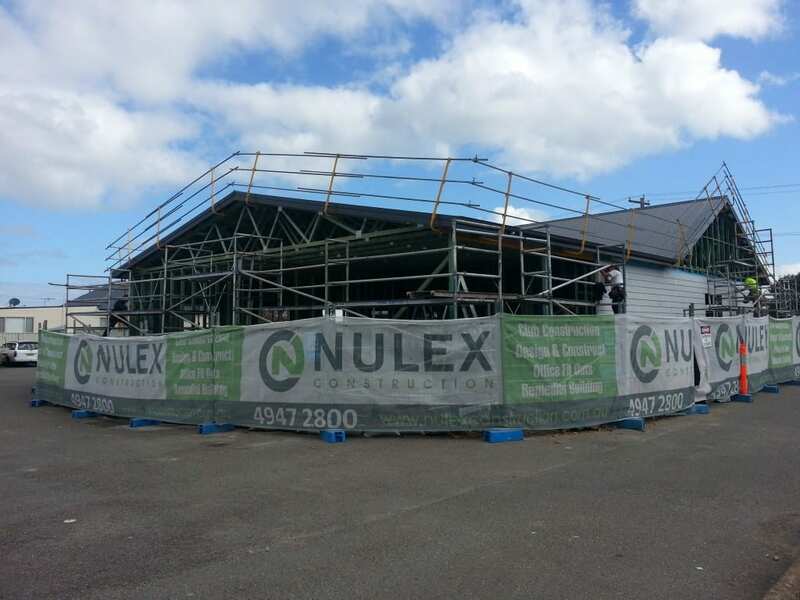 It is important to understand that no commercial project is the same and we strongly recommend meeting with a Nulex Construction prior to commencing your job to ensure the best possible project outcome. If you are thinking about your next commercial project or would like to have a chat about an existing project please contact our team today. In the meantime, feel free to browse our portfolio of past projects.